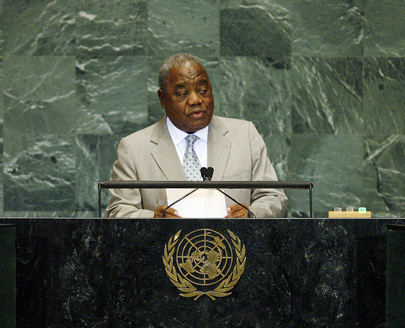 RUPIAH BWEZANI BANDA, President of Zambia, said the General Assembly was opening against a backdrop of global financial crisis -- a timely reminder of the consequences of his country’s overdependence on one source of revenue: copper. Thus, Zambia was taking on the diversification of its economy –- in agriculture, tourism and manufacturing –- as well as programmes aimed at improving the business environment. However, the true way forward would be an expeditious conclusion of the Doha trade negotiations. He applauded United Nations efforts to tackle climate change, noting, however, that efforts to raise the living standards of the world’s poor in order to meet the Millennium Development Goals were being frustrated by the effects of climate change. He recalled a time in Zambia when forests had been “within a child’s walking distance” and teeming with animals, birds, plants, insects and fruits. Today, however, his grandchildren would be lucky to be able to name the country’s indigenous fruits on the fingers of one hand. As the Copenhagen Conference drew near, Zambia hoped for an agreement that would balance climate change concerns with development. Calling for reform of the Security Council, he said it needed to be “more representative, democratic and accountable to all Member States, irrespective of status”. Given that Africa constituted the second largest bloc of United Nations Member States, proposals to reform the Council should heed the region’s call for two permanent seats, with veto power, and two non-permanent seats that would “address the historical injustice against Africa”.